Europa & Europa SEThere are 5 products. High capacity, lighter, anti-surge alloy fuel tank designed to reduce the risk of fuel surge in track day and race cars. Alll alloy 45mm triple-pass, twin-row radiator designed for motorsport use. 45mm core. 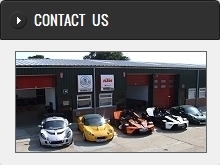 Fitment: All Elise/Exige and 2-Eleven variants.